Catrina Jones is a qualified editor of this website aimed at multimedia software. She is a regular contributor of product tutorials, reviews as well as tips and tricks, helping all users edit, download or create enjoyable videos. Have you ever received a M2TS file from someone with your iPhone but encountering a situation that you cannot open the file directly? At this moment of time, you may ask: what is file extension M2TS and how to open it on iPhone? This article will cover everything you want to know. M2TS file is a type of video file associated with Blu-ray BDAV MPEG-2 Transport Stream. It's primarily used in camcorders like Sony and Canon which feature high definition recording formats. (Click here to get more info about M2TS) To make the M2TS file watchable on iOS devices, you need to convert it to iOS supported video formats such as MP4, MOV, H.264, etc. Luckily, here’s a professional tool that empowers you to convert M2TS to MP4. 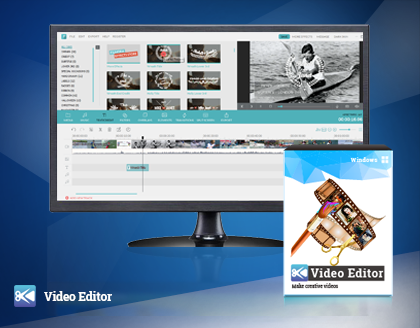 Video Converter Ultimate is a professionally-made program that enables you to edit and enjoy videos in an easier way. Besides supporting videos conversion to iPhone, iPad, Samsung, HTC, LG, PSP, PS3, etc., this program also lets you convert HD-camera video formats including AVCHD, MTS/M2TS, AVI HD to any desirable format simply. A wide range of video formats such as AVI, MP4, MPG, MOV, FLV, MKV, MTS/M2TS, WMV, etc. are supported. Now learn more by following the step-by-step guide. Video Converter Ultimate is the most easy-to-use M2TS to MP4 converter. Download and get the trial version below. Download and install Video Converter Ultimate on PC, and you will see the main interface. Now click on "Add Files" > "Add Files" or "Add Folder" to open the M2TS file. You are able to preview and edit the video once it's been loaded on the program. If you would like to trim, adjust, or add effect/watermark/subtitle to the video, then click on "Edit" button to open the editing window. If you have no wish to edit the video, then skip this step. Go to "Output Format" and click on "Format", you will see a list of video formats waiting to be chose. Select "MP4" and then go to "Preset" section in the bottom-right corner, you can choose to save the converted video as "High Quality" or "Small Size". Before start converting the M2TS video format, go to "Output Folder" to select the output destination. After that, tap on the blue "Convert" button to get started. Once it’s done, you can transfer the converted video to iPhone wirelessly. With Video Converter Ultimate, converting M2TS to MP4 is that easy! Aside from videos conversion, you can also use this program to download online videos or record videos on computer. If you wonder what else this program can do for you, download and have a try now!